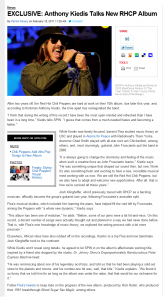 After two years off, the Red Hot Chili Peppers are hard at work on their 10th album, due later this year, and, according to frontman Anthony Kiedis, the time apart has reinvigorated the band. While Kiedis was family focused, bassist Flea studied music theory at USC and played in Atoms for Peace with Radiohead’s Thom Yorke, drummer Chad Smith played with all-star rock act Chickenfoot, among others, and, most stunningly, guitarist John Frusciante quit the band in 2008. Josh Klinghoffer, who’d previously toured with RHCP as a backing musician, officially became the group’s guitarist last year, following Frusciante’s amicable split. 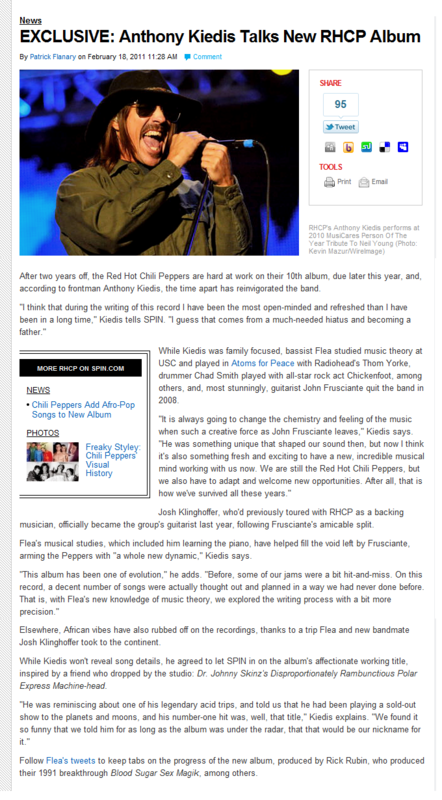 Flea’s musical studies, which included him learning the piano, have helped fill the void left by Frusciante, arming the Peppers with “a whole new dynamic,” Kiedis says. Elsewhere, African vibes have also rubbed off on the recordings, thanks to a trip Flea and new bandmate Josh Klinghoffer took to the continent. While Kiedis won’t reveal song details, he agreed to let SPIN in on the album’s affectionate working title, inspired by a friend who dropped by the studio: Dr. Johnny Skinz’s Disproportionately Rambunctious Polar Express Machine-head.